Wash the rice with water. Drain the water keep rice aside. Heat ghee in pressure cooker (2-3 lit). 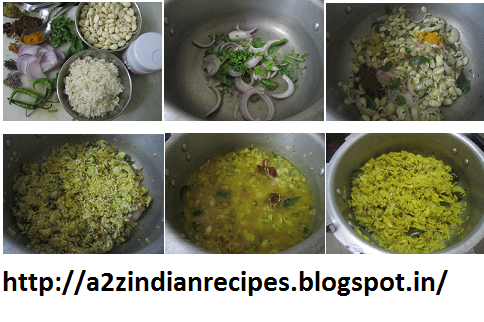 The add cumin seeds, mustard seeds, curry leaves, green chilies and chopped coriander. Saute for about 1 min. Then add vaal, mix well, saute for 3-4 min. Then add turmeric powder, garam masala, coriander powder, mix well, saute for 2-3 min. Then add rice saute for 3-4 min. Then add hot water, tamarind, jaggery and salt to the rice, stir well. Cover the lid, pressure cook for 3 whistles and then immediately release pressure, turn upside down. (if you want more soft rice then cover lid or keep without lid). Vaal is takes time to cook so i use pressure cooker.